We’d love your help. Let us know what’s wrong with this preview of Wyrmhole by Jay Caselberg. 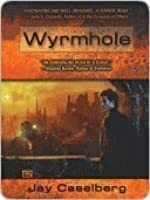 To ask other readers questions about Wyrmhole, please sign up. Interesting concept of a psychic investigator in Future Earth. Good characterization. The story seemed to fall apart near the end: characters appeared that didn’t seem necessary and I’m not convinced of the logic presented for solving the case. Protagonist Jack seemed a bit dense about some of the mid-book clues. The title also gave away a good part of the mystery. This was a promising set-up, a psychic detective in a future Earth. The psychic PI, though, was somewhat soft: he certainly worked with his intuitions, but after the first few, I was thinking, "Um, buddy, shouldn't you be working some more typical investigating as well?" Also, he's... well, a bit dense. The mystery is this: some miners on a far-flung asteroid have gone missing, and the big corporation who hired him seems a tad shifty. A clerk working for the company gives the detective some infor This was a promising set-up, a psychic detective in a future Earth. The psychic PI, though, was somewhat soft: he certainly worked with his intuitions, but after the first few, I was thinking, "Um, buddy, shouldn't you be working some more typical investigating as well?" Also, he's... well, a bit dense. The mystery is this: some miners on a far-flung asteroid have gone missing, and the big corporation who hired him seems a tad shifty. A clerk working for the company gives the detective some information, and before you know it, our hero is having the plot handed to him, over and over. I'm being harsh with the story, and I did enjoy parts of it, but the detective himself just wasn't... well, useful. The sidekick he ends up with (a whored out minor girl) has more savvy than he does, and pretty much solves some of the bigger chunks of the story. Also, titling the book "Wrymhole" kind of gave a whole lot of it away. Do you think it had anything to do with teleportation? Sheesh. The good part? The setting - a city that is somewhere between nanotech and biotech, that grows itself, moves itself, and recycles itself. Your apartment may start close to New (the area most recently formed/grown), but as time progresses, it'll degrade and New gets further away, and Old closer. It's a neat setting, and enjoyable in places. But it didn't quite carry the whole tale. Jack Stein, Psychic Investigator. 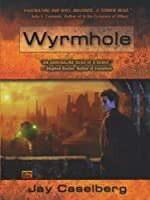 It's a great hook, and Jay Caselberg brings in some wonderful ideas over the course of his debut novel Wyrmhole. Stein is hired to investigate the disappearance of a miner. He's also hired to learn more about a lost handipad (PDA) that comes into his possession. Naturally, the cases are related, leading him into a web of business deals and betrayals. I wanted this book to be more than it was. I never felt all that connected to the protagonist, or to any of the cha Jack Stein, Psychic Investigator. It's a great hook, and Jay Caselberg brings in some wonderful ideas over the course of his debut novel Wyrmhole. I wanted this book to be more than it was. I never felt all that connected to the protagonist, or to any of the characters, really. The plot also felt a bit forced. Of Stein's psychic abilities, Caselberg writes, "Things didn't happen by chance to Jack Stein. Coincidence was always loaded. Events seemed to coalesce around Jack." Unfortunately, that means the plot relies pretty heavily on these coincidences, which strains the credulity of the reader. One of the most fascinating concepts for me was the Locality, the self-contained city which constantly rebuilds itself, leaving the old portion to fall into decay and ruin. Thematically, it was a powerful symbol, in addition to being a downright nifty idea. I hope he does more with it in future books. Wyrmhole is a mystery set in an future that is much different than any I have ever imagined. It is a story about a P.I. (Psychic Investigator)that lives in a city that is constantly rebuilding itself as it travels across the land. He has a very difficult case that may be beyond his abilities. The characters have real depth and seem to be real people. I recommend this book to anyone that likes mysteries or science fiction (or both). Maybe a bit less than 4 stars. Private Detective story - multiple clients, various suspects, thugs, woman trying to seduce him to sidetrack his investigation, corporate mischief, wheels within wheels, etc. Interesting future setting. Not what you'd call a hard-boiled PI. The PI is a "psychic investigator" - but that's essentially intuition, "luck" and some dreams which have clues if you can figure out what they mean. So it didn't really incite my aversion to "psychic powers" in SF. Jake Stein is a psychic detective, and not a good one. He gets a case, then a related one, and stumbles around finding things out, getting beat up and finally figuring things out with much help from a precocious young girl. There are clues the reader has put together, but not Jake; I can't tell if it's supposed to be that way, so I guess it is, to show us just how bad he is. First read this and its sequel some years ago. Just saw them and two others in the series available in a $9.99 omnibus kindle edition, which I bought. 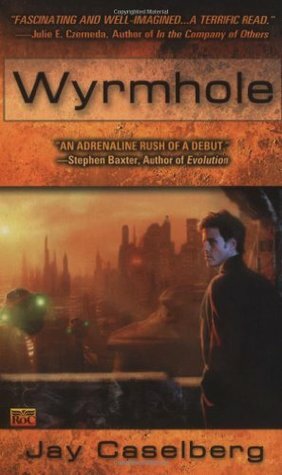 Upon the re-read, time apparently has been kind to my memory of Wyrmhole. It was ok, but not great. Both Richard K. Morgan and Peter Hamilton have done the science fiction detective story far better. Very interesting concept of a futuristic world. I am not sure how much I believed in the main character. At times he seemed dense and wimpy. The story also was a bit choppy or disjointed in areas. The ending was pretty anti-climatic. I did however was really intrigued by the character of Billie. I wouldn't mind knowing more of her story. I gave this book only 3 stars because I didn't think the writing style was enthralling. I DID think the idea of a city that ages and renews itself was very interesting, and some of the characters in this book were very well written. Maybe 3.5 stars. Good read. Interesting and feasible concepts. GOod for a beach read. However, upon writing this review a month later I cannot recall how it ended. That says a lot.